The Ghetto Biennale is an invitation by a group of Haitian artists to visiting Western and non-Western artists to come to Haiti and 'make work' with them to produce a show at the end. 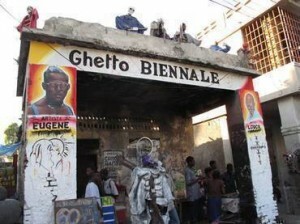 In December 2009 Atis-Rezistans, the Sculptors of Grand Rue, hosted their first ‘Ghetto Biennale’. 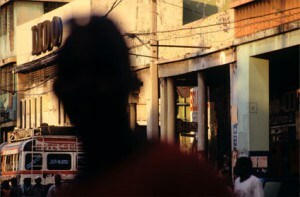 They invited fine artists, film-makers, academics, photographers, musicians, architects and writers, to come to the Grand Rue area of Port-Au-Prince, Haiti, to make or witness work that was shown or happened, in their neighbourhood. In the words of the writer John Keiffer it was a ”third space’…an event or moment created through a collaboration between artists from radically different backgrounds’. 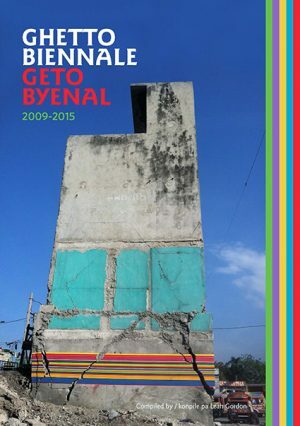 Artists from many countries including Australia, Italy, the UK, Jamaica, the USA and Cuba came to Haiti to participate in the Ghetto Biennale. The Ghetto Biennale is an invitation by a group of Haitian artists to visiting Western and non-Western artists to come to Haiti and ‘make work’ with them to produce a show at the end. There are a number of complex and over-lapping motives for this event. 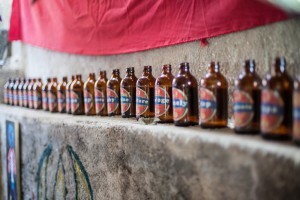 The lack of formal arts training in Haiti, whilst possibly liberating in many ways, leaves youths and artists sometimes very frustrated in their thirst for new ideas, influences, mediums and aesthetics. The Ghetto Biennale is an arena within which the visiting artists and academics can share philosophies, ideas and aesthetic practices with Haitian arts practitioners. Presentation is an important aspect of the work of Atis-Rezistans and they have created a unique and local site specific installation in their own neighbourhood. 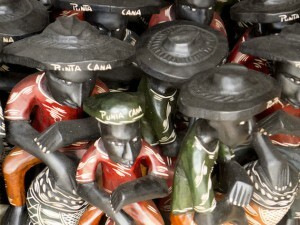 This project has allowed Haitian artists to expose their work, in situ, to the visiting artists, curators, journalists and academics. This has given Haitian artists’ the chance to reach a far wider audience, make important contacts and integrate with wider arts networks. 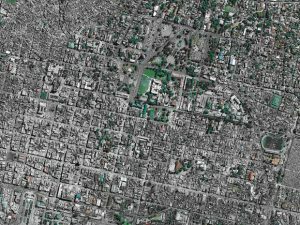 Atis-Rezistans also want to use the Ghetto Biennale to portray a more creative aspect of Haitian reality, to counterbalance the current, dominant negative portrayal of the country. 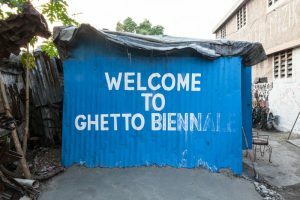 The Ghetto Biennale is an alternative model of tourism which brings visitors who can have positive and creative experiences in Haiti and learn about the rich cultural heritage. The project highlights issues of migration and global freedoms of association and gives collaborative and creative possibilities between artists from radically different backgrounds to explore and address these issues. It is also questions the advancement of globalisation and Western hegemony. The Ghetto Biennale is calling for applications for its fourth edition and invites artists and curators to explore what potentials the radical tools, Kreyòl, Vodou and the Lakou, have to offer to the contemporary world. Call for Applications: 4th Ghetto Biennale 2015. The 3rd Ghetto Biennale seeks to expose the boundaries of a globalized art market, and have meaningful discussion about sameness and diversity in an allegedly de-centered art world. 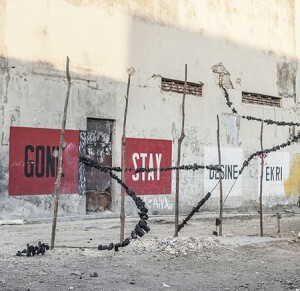 3rd Ghetto Biennale 2013: Participating Artists. The 3rd Ghetto Biennale 2013: Decentering the Market and Other Tales of Progress. Apply now: The 3rd Ghetto Biennale 2013. 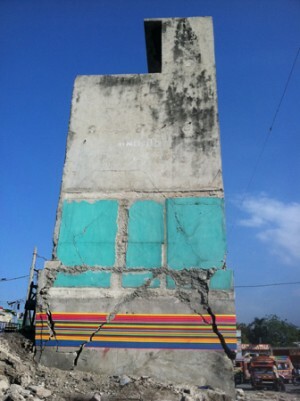 All works of the 2nd Ghetto Biennale 2011 are made and exhibited in Haiti.